#250 - Princess Minon Minette - $175 - Bisque, jointed legs. Labeled box is somewhat faded and dusty with some broken corners and scuffed label. Doll is wonderful with a lovely gold crown. #255 - Regina - SOLD - Bisque, jointed legs, heavy wrist tag. Such a beautiful doll and hard-to-find (her robe tie is there too! ), but significant age spotting on her robe. The dress underneath, however, is very nice so she could be displayed without the robe. There is also some discoloration to the edge of her lace -rimmed slip and pantaloons, but, of course this is covered when dressed. This is one of the few situations where I'd consider trying to get the spots out of an outfit, but will leave that to her new owner. #258 - Eugenia Marie - $95 - Bisque, frozen legs, wrist tag. Scattered age spots on her pink underskirt are mostly hidden by the sheer yellow dress. Displays very nicely. #260 - Eulalie - SOLD - Bisque, frozen legs. Crispy clean outfit with only a couple teeny age spots on her left sleeve. Very pretty! #402 - Oh Susannah - SOLD - Plastic, black sleepy eyes, fully jointed. Excellent condition, but she is missing the pink ribbon ties on her hat. #N/A - In My Easter Bonnet - $95 - Bisque, frozen legs, labeled box with cute Easter insert. This doll is unusual in that Nancy Ann did not assign an id# to her. Beautiful doll! 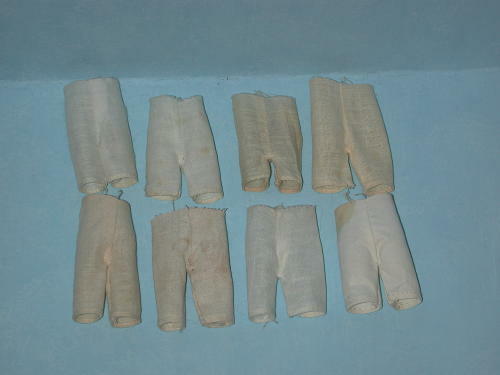 Pantaloons - Original Nancy Ann pantaloons with the narrow hem for the frozen leg dolls are available at $3.00 each. Quantities are limited. Pantaloons may be mailed in a flat envelope for the price of first class postage. Currently out of stock. Boxes for bisque dolls. Click picture for details and more boxes in all sizes. 84 Ring Bearer, 86 Bride, 87 Bridesmaid, 113 Roses Are Red, 191 May. 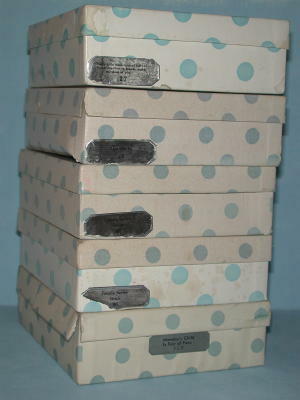 Boxes priced $10-15. Wrist tags - $10 each. 115 Lucy Locket, 160 Pretty Maid, 171 Daffy Down Dilly, 176 Nellie Bird. Click picture for details. Doll body - $10 - Click picture for more details. Bisque legs - $15 each. Only right legs available. Minor chips at hip. 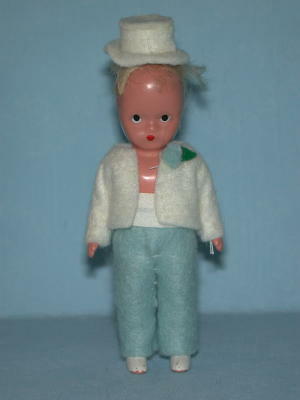 #84 - Ring Bearer - $10 - Painted eye plastic, fully jointed with white boots. Homemade outfit and missing most of his hair. A great "parts doll" or fixer-upper for those who love "well-loved" dolls! Same body used on Flower Girl. Picture N/A Bisque Arms - Original Nancy Ann Arms for the 5.5" frozen leg bisque dolls are available for $5.00 per pair or $3.00 for right arms. (Sorry no single lefts!) Quantities are limited. ($10 minimum total order on the site.) Currently out of stock of the pairs.